5 x 7" 6 x 6"
A fun and simple way to make prints of objects or negatives, this Cyanotype Paper from the Cyanotype Store is a 12-sheet pack of 11 x 14" white paper. 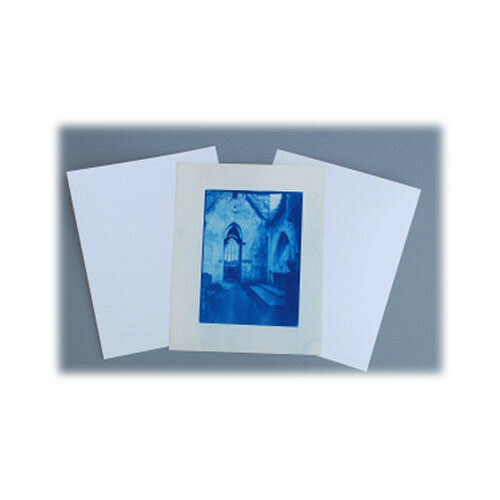 This paper is pre-treated for cyanotype printing, which allows you to simply arrange your objects or film on top of the paper, expose using sunlight, and process by rinsing in water. The cyanotype process is archival and the 100 lb hot press fiber-based paper is durable, making it well-suited for repeated rinsing if toning the prints to achieve a different color effect. Box Dimensions (LxWxH) 14.5 x 10.5 x 0.2"